Woops! Terrorism Still a Problem! Yes, my headline is dripping with sarcasm. I thought that Barack Obama, The Messiah, was going to heal the world with his rhetoric of change. This weekend however was a grim reminder of what people all over the world are up against. Islamo-fascism is alive and well. Like Bush or hate him. One thing he has done since 2001 is that he has kept America safe. NO terror attacks have occured in this country. 0. Nada. We have had alerts, including in New York last weekend, but no attacks. We are at War. People may have grown war weary, but make no mistakes. We are at war. These EVIL people want to anihillate the non-Muslim world. They will stop at nothing. There is little chance that they will be habilitated. It is a scarry thought indeed. What makes me sad, above all, is that it may just take another terrorist attack on our own people in America to reawaken the people of this country as to just what we are up against. We live in terrifying times indeed! Redistribution of Wealth and "Fairness"
The Obama campaign has repeatedly said that their tax plan is "fair" and that the rich needs to pay more. They contend that the tax policies of the Bush Administration has helped to expand the gap between the rich and the poor, and they essentally need to pay their fair share. The implication is that the middle class pays a disproportionate amount of federal income tax. Lets examine this premise. According to the National Taxpayers Union, in 2006 the top 10% of wage earners in the USA, (who make over 100,000 per year and up pay 70.79 % of the federal income taxes. Furthermore, if you look back, according to the same website in 1999, the same top 10% paid 66.45%. So the so-called rich are paying a higher percentage of federal income tax than ever before. There are two facts that must be said. To cut taxes across the board is to give the rich a bigger tax break than the middle class. If you cut taxes by 5% across the board, the rich get a bigger tax break. Why? because they pay so much more in taxes. Take for example a person whose taxable income is $500,000 per year, at 35% they pay $175,000. Take a person who's taxable income is $50,000, at 25%(Which is the tax bracket for this income group)they will pay $12,500. So if the government lowers tax rates across the board by 5%. They person making 50K will now pay 10,000 in federal taxes. The 500K income earner will pay $150,000. The rich person's tax break will be more than the middle class earner's tax bill. Both income earners recieved the percentage of a tax break, but the "rich" person's tax bill goes down by a much higher dollar amount. Barack Obama wants to redistribute wealth. He said as much to Joe the Plumber. He said that "if you spread the wealth around, it is good for everyone." One the one hand to many, this might sound good. They might think, "Yeah, stick it to those greedy bastards." But one has to understand the consequences of puntative taxes. The fact of capitalism is that the "rich" employ the rest of us. Whether it is a huge corporation like Haliburton or Microsoft, or a small business owner who employs 15-20 people, lower and middle class Americans are employed by people like this. If the government under an Obama administration decides to raise taxes on Corporations and small business owners, these new taxes will drag the economy down. Any company, large or small, is in business to make money, not to employ people. If profits are not there, the company will cease to exist. A company that has its taxes raised, will have to cut jobs to keep its profit margins or risk its ability to compete. The last thing this country needs, with the economy in its current state, are tax and economic policies that will hurt and push the economy into a deep recession or worse. Oh, how I wish that Mitt Romney were the man at the top of the GOP ticket. A brilliant economic mind was thrown under the party bus by single issue voters. David Brooks of the New York Times recently said that Sarah Palin "represents a fatal cancer of the Republican Party." His intellectual bloviating can be found here. I love how he can say this about Sarah Palin when he knows so little about her. I got news for him. She is not a cancer, but rather she is a shining light of conservatism that the Republican Party needs. She has taken on corruption in her own party in Alaska and is wildly popular in her state. Every intellectual likes to paint any Conservative as a simple minded dolt. If that Conservative is a powerful politician, he gets even more stupid. Ronald Reagan, who was a man of ideas, was anything but stupid. He was a man of ideas, as Brooks puts it, but he was so much more. He also was a man of action who got things done. The left tried to paint him, first as a stupid talking head former "B" movie star, then as a senile old man. Most of the republicans that swept into power in 1994 were dismissed as idiots. George W. Bush (in my opinion not a conservative), is consistently caricatured as a simple minded religious nut. Dan Quayle was destroyed by the press and painted as a stupid idiot. Since liberals have nothing new to offer, they are going after Sarah Palin in much the same way. She is being painted as a simple minded woman from a the back country. People like Brooks say that she is a cancer, because of her "anti-inellectualism." Let me explain why the Republican party is in trouble. It is not because of a lack of ideas. It is because Republicans in the House and Senate have 1)become to moderate, and 2)spent like Democrats used to. Had Republicans in the House stayed true to the conservative ideals that got them elected in 1994, they would have not lost control of the House of Representatives. President Bush, apart from trying to keep America safe against Islamofascism, has consistently departed from Conservative principals. Had he adhered to such principles, he would not be nearly as unpopular as he has become. Sarah Palin scares liberals to death. She, in my opinion, is Ronald Reagan in heels and lipstick. Her weakness is not her lack of experience (She does have more experience than Obamma). Her weakness is that she has to carry the water for Senator McCain. McCain losing the election will not be the end of her. Give her four years to run her country effectively and prepare to run for President and watch out. Liberals know this, and that is why they are doing everything they can to discredit her. Their attemps to smear and discredit her will not work, and if libs continue to underestimate her, they will find her wonderful family in the White House in 2012. So, I got tired of Barack Obama claiming that he had written a letter to Treasury Secretary Paulson claiming that he sounded the warning bell of the current financial crisis. Here is the quote from the first debate at the University of Mississippi. Two years ago, I warned that, because of the subprime lending mess, because of the lax regulation, that we were potentially going to have a problem and tried to stop some of the abuses in mortgages that were taking place at the time. Obama again said the same thing in the second debate. The key here is the context. His comments were in response to Senator McCain talking about Fannie Mae and Freddie Mac how these two GSE's were a major cause of the current financial crisis. Obama has repeatedly said he wrote this letter warning of these problems. Well, I found the letter. Here is the link to the letter on Barak Obama's Senate website. There is grave concern in low-income communities about a potential coming wave of foreclosures. Because regulators are partly responsible for creating the environment that is leading to rising rates of home foreclosure in the subprime mortgage market, I urge you immediately to convene a homeownership preservation summit with leading mortgage lenders, investors, loan servicing organizations, consumer advocates, federal regulators and housing-related agencies to assess options for private sector responses to the challenge. Of course, the adoption of voluntary industry reforms will not preempt government action to crack down on predatory lending practices, or to style new restrictions on subprime lending or short-term post-purchase interventions in certain cases. My colleagues on the Senate Committee on Banking, Housing and Urban Affairs have held important hearings on mortgage market turmoil and I expect the Committee will develop legislation. I have highlighted the latter part of the post to illustrate Obama's lack of leadership on this issue. He speaks of mortgage market turmoil and says that HIS COLLEAGUES will develop legislation. IF this is a reference to the problems at Fannie and Freddie, which I don't think it is, Obama leaves dealing with this issue to his colleagues. I don't know about you, but this is not what I want to hear from someone who is supposed to be leading America. It has been seven years since the attacks on 9/11/2001. I can remember feeling so unsafe for so long after the attacks, wondering if another attack were imminent. I am thankful that President Bush made the tough choices, regardless of the political ramifications. While the liberal left continues to rail against President Bush, I am confident that honest history will, at least on this issue, write positively about our 43rd President. I for one am proud to have voted for him twice. Jack Nicholson's character in A Few Good Men said, "You don't want the truth because deep down in places you don't talk about at parties, you want me on that wall, you need me on that wall." President Bush has stood on "that wall" for seven years. He has made the tough choices regardless of the political consequences. He has had the personal fortitude necessary to maintain his vigil despite the fact that his political allies have left his side. 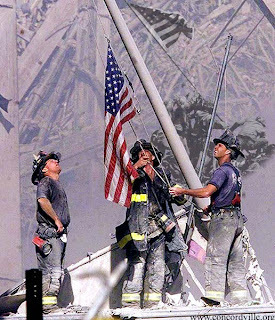 I remember a poster that a grocery store chain gave away following 9/11 that had a picture of the World Trade Center towers and a headline stating, "We Will Never Forget." So many of us have forgotten. We have forgotten how unsafe we all felt following those attacks. We have forgotten because those who have been entrusted with our saftey have kept us safe. As we forget, and diminish the threat of terrorism that is still very real, we diminish the gravity of the loss of innocent life that occured on this day seven years ago. On the anniversary of this solemn day I am reminded of those who gave their life by bringing down their own plane in that field in Shanksville, Pennsylvania. They were the first heros to give their life in the War on Terror. To echo John McCain's scripture reference today in his remarks, in John 15:13, the Savior said, "Greater love hath no man than this, that a man lay down his life for his friends." Those people on United flight 93 gave their lives that morning for their "friends" that they never met. True Americans honor you on this day. God Speed. Why a new energy policy is essential in America. No. Not because we need to save a planet suffering from man-made global climate change. I simply don't believe that this is a crisis. But rather, it makes sound economic policy for the United States of America to not be dependent on foriegn oil and energy. By purchasing the vast majority of our oil from countries that would destroy us if they think they could do it and get away with it, the U.S. is indirectly sponsorning both Marxist Dictators (Putin in Russia, Chavez in Venesuala) and state sponsored terrorism. We simply, as Americans, can no longer let this happen. We have to have a two pronged attack. First. We need to utilize our own domestic supplies, especially the oil deposits in ANWAR and the Outer Continential Shelf. We also need to start using coal-to-oil technologies which apparently are easier and more cost effective than oil shale. But we must also start investing heavily in alternative energy sources. While I do not think that global warming (climate change) is a real problem, I do think it behooves us as caretakers of the planet to be more proactive in keeping our enviornment clean and safe, and to clean up our own messes. I would love to be able to one day get into my hydrogen powered car and drive to work, knowing that my automobile is not poluting one bit. This would be a great unintended consequence of a sound energy policy. I never understood this until recently, but a good domestic energy policy is coupled with foriegn policy. We as Americans cannot stand by and allow billions of dollars each day be sent to rouge nations simply because we are too lazy or complacent to want to do anything about it. This "head-in-the-sand" way of dealing with things will only spell our doom. Count me in for McCain-Palin. I have to say. I was excited about Sarah Palin being picked as John McCain's running mate. I still have my reservations about McCain's conservative credentials, I have to say that I am on board with the Republican Party. I am100% for this ticket, and I hope and pray that the American people vote these two into the White House. Tonight, Sarah Palin gave a speech that politicians only dream of. She delivered her speech with panache, grace, femininity and power. She told us her story, proud that she is from a small town and comfortable in her own skin. She took shots at Obama, that I think will resonate with Americans. She was funny, and self depricating. In all, it was one of the best political speeches that I have seen in years. As I have watched in disgust, the personal and chauvinistic attacks that have been levied against her, I grew more and more angry and frustrated. But after her speech tonight I realized something. This is all the liberal left has. She is the worst nightmare for the Democrats. She is beautiful, articulate, witty, and sharp as a tack. But what is really bad for the libs, is that she walks the walk. She is truely a reformer and a whistleblower. She is pro life, and lives it. She is a successful, CONSERVATIVE, mother of five. In the end the criticisms of Sarah Palin ring hollow, and what the "drive by" media may have done is propelled this "everywoman" into the spotlight, and might cause such a backlash against elitism and sexism that might propel the McCain Palin ticket into the White House. So, I am hearing rumblings that John McCain may be considering a pro choice Vice President. I have been listening to the pundits debating how this would help or hurt his campaign. The argument from pro-life McCainanites is that because he has always been pro life, it will balance out the ticket. The other side says that conservatives will be put off by a pro choice candidate and will stay home thereby handing over the election to BHC. I got news for McCain and his campaign. While I have sipped the Kool-Aid and have decided to vote for McCain in the general election, My vote is not set in stone. I am a staunch conservative, and in fact consider myself a Conservative first and a Republican second. I was and still am not happy with McCain as the Republican nominee. If McCain chooses a pro choice candidate, I am done with him. He needs to pick a conservative whose credentials are without dispute. Leiberman, while correct on the war in Iraq, is wrong on many many issues that conservatives hold dear. And we Conservatives have not forgotten that McCain has left the reservation on several key Conservative issues. Yes McCain has moved to the right to try to appeal to the Republican base, but he has to do more. Choosing a strong pro life, Conservative would go a long way to appeasing Conservatives like me that still feel that they are going to hold their noses while they vote for John McCain this November. I was not able to watch much of the Olympic Trials this week as I have been quite busy, there are is one story that has really fascinated me. It is the story of Lopez Lomond, one of the lost boys of Sudan who won an NCAA championship in the 1500 meters this spring and today qualified for the Olympics by placing third at the US Olympic Trials in Eugene, OR. Reading his story this week in several publications, brought tears to my eyes to hear him talk about what he went through to get to the US, and how much he cherishes his American Citzenship that he obtained only one year ago. He went through so much, that I felt some shame thinking that my youth was difficult at times, because I had trouble making friends. This kid lived for 10 years in a refugee camp in Kenya, believing that his family was all dead. He came to the US just six years ago, and now will represent his adopted home country in the Olympics in Beijing. As I watched today, I was not rooting or even paying attention to Bernard Lagat, another naturalized American from Africa who will represent the US this summer. I was as nervous for Lomong as I have been for any BYU or Angels team that I root for. When he crossed the finish line, I got a little choked up and felt so happy for a kid who's dream to run in the Olympics is coming true. As i heard his quotes, I was reminded of how blessed I am to live in this Country. Too often we as Americans make excuses, or bad mouth this country for such stupid reasons. This young man came here after seeing unspeakable horrors, has never made excuses and has worked as hard as he could to build on his God-given talent. As I have watched the youth of America be unhappy because they did not get a car for their 16th birthday, and listen to how this kid when he got to the US, thought the family that was taking him was joking when they had to go get their car, I get sick to my stomach. We have so much, but think we have so little. McCain, McCain, how can I vote for you? Every time I start capitulating and moving closer to the dark side and voting for the most famous RHINO (Republican in Name Only) of them all, McCain goes and says something that makes my stomach turn and worry about the future. The latest thing for me is him saying that Mayor Michael Bloomberg is a VP possibility. How stupid can he be. Bloomberg changed parties only to win the race for mayor. He is a democrat, plain and simple. Does he not know that if conservatives like me, who already feel abandoned by their party, don't get some sort of a bone from this guy, we will not vote. And if we do not vote, Obama is a shoe in. What a scary thought. Let me explain why I have such reservations about Mr. McCain. 1) He is not a conservative. He may be hawkish, on the war against terror and Iraq, and he has been consistently pro-life, but these two positions alone do not make him a conservative. Conservatives stand on principle first and then shape their political views based on these guiding principles. John McCain, based on several pieces of legislation, does not have conservative principles guiding him, and in fact quite often McCain seems side more often with the mainstream media and the editorial board of the NY Times, hardly bastions of conservative thought. 2) McCain has consistenlty and purposfully stuck his finger in the eye of Republicans time and time again. He often uses similar rhetoric to that of liberals when he defends his positions. As he has galavanted around the Hill brandishing his Maverick label, he has angered many in the Republican leadership. We conservatives have watched him and quite frankly are sick of his antics. Now that his assension to the nomination is all but assured, he is now trying to mend fences. He now is starting to claim that he is a conservative. He keeps saying that he was a foot solider in the Regan revolution. Please. I doubt that any true conservative would have seriously considered switching to the Democratic Party, the way McCain did. I doubt that any true conservative, in the mold of Ronald Reagan, would have seriously toyed with the idea of crossing party lines and ran as John Kerry's running mate in the the 2004 Presidental election, the way McCain did. Now I am hearing from some people that I once respected say that McCain is a Conservative. Please. Stop trying to convince me. I will never believe it. McCain needs to go past idol words before I will believe that he has seen the Conservative light. My choices this fall will consist of one of two socialists, versus a RHINO. My first inclination is to just sit out this election and let the chips fall where they may. I doubt in the end I will do that, and while holding my nose, vote for Mr. McCain. I doubt though it will do any good. The Republican Party has done this to itself. It abandoned Conservative principles, spent like democrats, expanded the size of government, and then lost control of both houses. Now the party is on the verge of losing the White House as well. Not because the country has become more liberal, but because the Republican leadership has abandoned Conservatives, and demoralized its base, leaving us with little motivation to get out and vote. As I wrote a few days ago, I was struck with the public sadness concerning the death of Heath Ledger. He was a good actor, but was a great person? I kept asking myself, what did this man do for others? What did he do that caused so many strangers to mourn for his loss? And then yesterday everything was put into perspective (well at least for me it was). Gordon B. Hinkley, President of the Church of Jesus Christ of Latter-Day Saints, died at the ripe old age of 97. Reading a detailed obituary in the Deseret Morning News (http://deseretnews.com/article/1,5143,695247765,00.html), I was struck at the quality life that this man led. He spent most of his life in the service of others. He was a truly great leader. He became prophet not long after I got married, and so I think that I paid closer attention to his leadership as prophet than I did to any prophets that had led this church in my lifetime. Thus, I think this explains my melancholy mood. I never met President Hinkley, but felt close to him. I admired the way he led, by example. He was an energetic man, who seemed to be everywhere. I knew that the Lord must have been giving him strength, as he was doing all of this in those years that most spend relaxing and playing golf. He made some policy changes that I really liked (namely the "raising the bar" standard for prospective missionaries). I think that losing this prophet hurts me the most because he was always so visible, and it was rather sudden (as sudden it can be when a 97 year old dies). I will miss him, but I am happy that he is with his lovely wife once more. God speed. I hope I am worthy to be with you in the next life. My Thoughts on Heath Ledger's Untimely Death. Yesterday, as I was finishing up work, a coworker mentioned to me that Heath Ledger (Brokeback Mountain, Ten Things I Hate About You, A Knight's Tale) was found dead in his bedroom in his apartment in Manhattan. He was 28. Signs point to an overdose of prescription drugs, however no cause of death has been identified, as of this writing. Many are comparing his death to that of James Dean, who died at a young age, seemingly at the beginning of a promising acting career. As I watched the news last night, I was amazed at the degree to which the mainstream media has reacted to the death of this person. What has he done? Has he fought for his country? Has he saved countless lives with some amazing invention or by dedicating his life to the service of others? No. He simply has pretended to be other people, and received awards, fame and fortune for doing so. He was a good actor, but I would not call him gifted yet. He had not made that many movies. I can understand the gay community's sadness, as he was the iconic star of a film that they think is brilliant and "speaks to them." The only thing that makes his death remarkable is that he was famous. Yet, so many are mourning him as if they were his friend. For some reason, we as people become emotionally connected to celebrities simply because we watch them on TV or read about them in newspapers and tabloids. I find it fascinating that when some actor, who has done so little is mourned like a hero, while so many who have done so much for this country, are forgotten about so quickly. Let us all take this time to remember those who have paid the ultimate price so that we all are able to live free in this country. These men and women, who have died in defense of freedom, are the ones who deserve our tears. Although Mr. McCain, of Arizona, roared into the state as the upset winner in New Hampshire that year — a feat he repeated last week — eight years ago he had neither the organization nor the money to respond. He lost the state to George W. Bush, and his campaign soon derailed. Herein lies the problem that I have with this article. The writer of this article does not come right out and say it but rather heavily insinuates that the smear campaign was what derailed McCain's presidential hopes in the year 2000. This assumption just is yet another example of how far off the main stream media is when it comes to Republican Presidential Politics. 1) McCain cosponsored McCain-Fiengold, which in essence destroyed a form of free speech in this country by limiting election adds and campaign contributions in during elections. The moderate supreme court upheld the law, but many constitutional scholars see this law as a clear violation of the first amemdment. 2) McCain supports amnesty for illegal imigration. He co-sponsored McCain-Kennedy, a bill wildly unpopular with the vast majority of all Americans. It was the grass-roots movements in America that killed this bill not once, but twice. 3)McCain accepts hook, line and sinker, the unproven hypothesis of man-made global warming. His rhetoric on this issue smacks of arrogance. He often speaks as if he is completely right and that those who oppose him are not only just wrong, but immoral and stupid for disagreeing with him. 4)McCain undermined the Republican leadership in the bitter fight to get Bush appelate judges confirmed. Republicans had threatened to impose the "neuclear option" and end the ability of the minority to fillibuster judicial appointments once they had received an endorsement from the judiciary committee. 5)McCain, just yesterday reiterated his unwillingness to look for oil in a small part of ANWAR, a place in Alaska that most Alaskans favor drilling. He equated drilling in ANWAR with drilling in the Grand Canyon or the Florida Everglades. Anwar is a wasteland. The plan is to leave 92% of the refuge alone. The area in question is described as a frozen swamp. Yet a source of oil in the US is not good for America, according to McCain. McCain did not lose the primary because he was smeared. He lost the primary because he is not Conservative. So don't let the press fool you. McCain would be a disasterous choice as the Republican nominee. He would get trounced in the general election.